Kit products allow store admins to offer highly-customizable products to customers. Prices and weights can vary by the choices customers make, and you can even have the software use products sold separately on your site as components of the kit, for inventory tracking purposes. 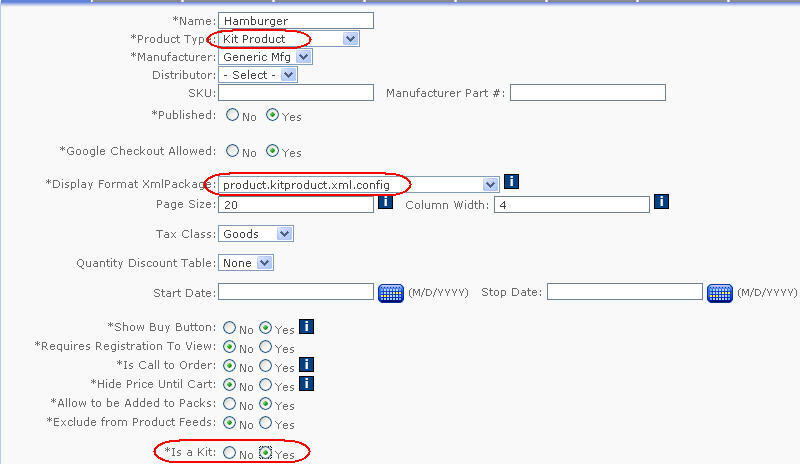 This guide walks through the process of setting up a kit product, using a hamburger as an example. 1 - First, create your basic product. Make sure that the 'Product Type' dropdown is set to Kit, the 'Display Format XML Package' is set to product.kitproduct.xml.config, and the 'Is a Kit' attribute is set to Yes. The price you set will be used at the base price, before customers choose any custom options. This price should include the cost of the default kit group options. See below for more information. 2 - Once you save the new product, you will see an 'Edit Kit' link next to the 'Is a Kit' option. Click that link to create the kit options. 3 - The first thing to do to set up your customer-selectable options is to create a new kit group. Each kit group contains related items that customers choose from - like hamburger patty size in this example. 4 - Within each kit group are the kit items. These are the choices that customers have within that group. 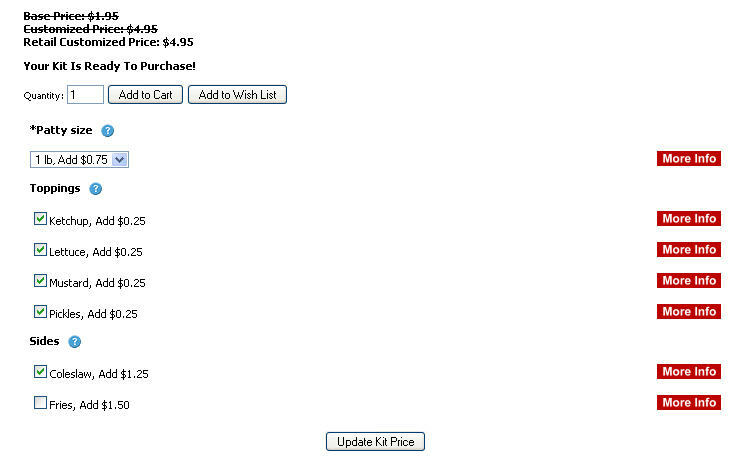 - Notice that the first item has no 'Delta Price' or 'Delta Weight'. This is because this item is marked as the default item for this group, so these values should be built into the weight and price you entered for the base product. The second item is an 'upgrade' so the weight and price change if a customer selects that option. 5 - Add as many kit groups and items as is necessary to offer all the options your product requires. Note the type of kit group in this image is set to Multi Select Checkbox. This allows customers to choose multiple options. 6 - The last kit group we're going to add to the kit contains items that we also sell separately on the site. The software offers the ability to track when customers choose these kit items and deduct them from the main product's inventory (this is not valid for products using *Track Inventory by Size and Color:). To do this, simply put the individual product's VariantID in the 'Inventory VariantID' field. Notice that if your separate product comes in different sizes/colors (such as small, medium, or large fries), you can specify the color/size combination to use. Customers choose the options they want and the price and kit description change to reflect those choices. 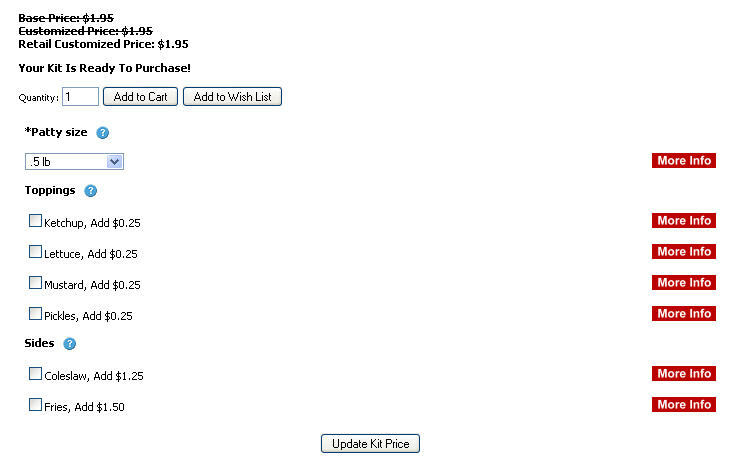 Once they're done, clicking Add to Cart purchases the customized item.